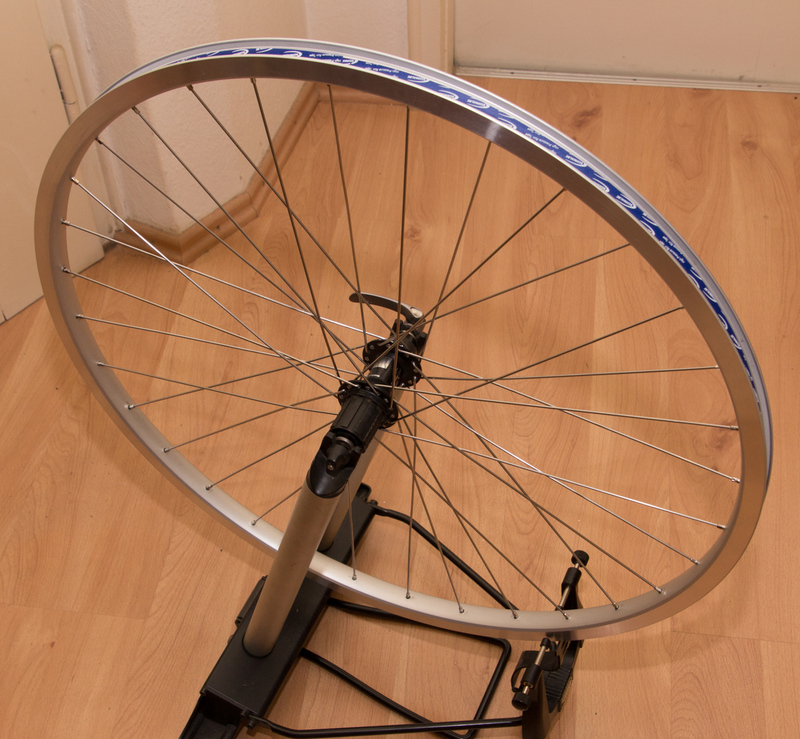 The wheels of my every day crosser are now nearly 10 years old – and therefore the rims as well. Due to the use of rim brakes the flanges became quite worn, especially on the front wheel where I could feel the brake pads sticking to the flanges with every revolution when applying the brake lightly which caused a “stuttering” of the wheel. The hubs – in the front Schmidt hyb dynamo and in the back a DT Swiss 340 – still work fine despite their age why I laced new rims. The old rims were Exal ZX19, hollow rims with with eyelets which were low priced and served well for many years. 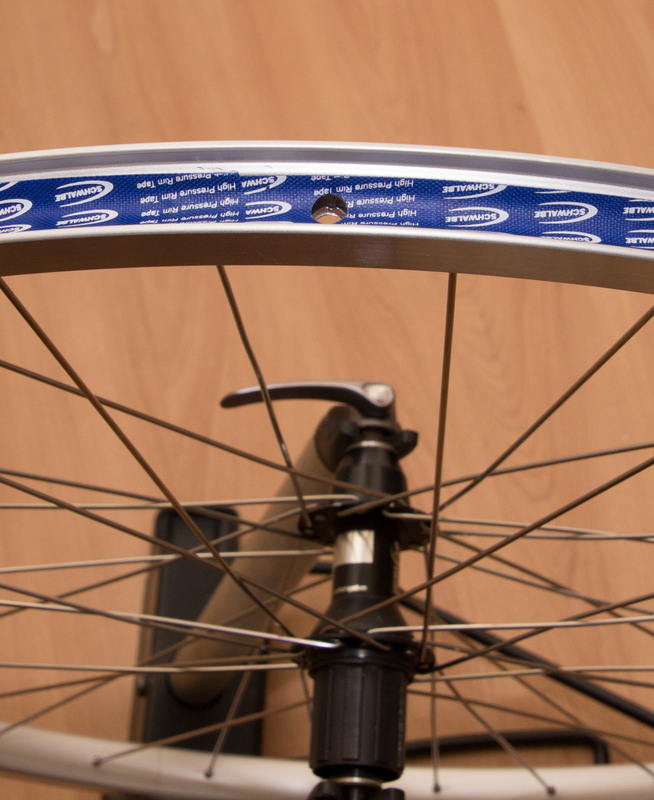 The new rims should have wider flanges and without “wear indicator groove”. Eyelets and pots were not really neccessary. At a local shop I was recommended to use the Andra 30 by Ryde (formerly Rigida) – not a very light model, but with quite wide flanges and without “wear indicator groove”. Instead of eyelets and pots it has a quite thick inner ring and the drilled holes for the spokes are not just offset to the left and right side but also slanted clockwise and anticlockwise so the spokes have to take less bending forces when entering the rim and the rim is also stressed less. In the past I often managed to work without an assembly stand. But I have to admit that it is not a luxury to use such a thing but makes many tasks much easier, especially when you have to remove the wheels. At a local shop I could get a foldable exhibition model 25% cheaper – very nice since I did not only save some money but I also did not have to assemble it ;-). Folded together it could be transported with my trailer very easily. 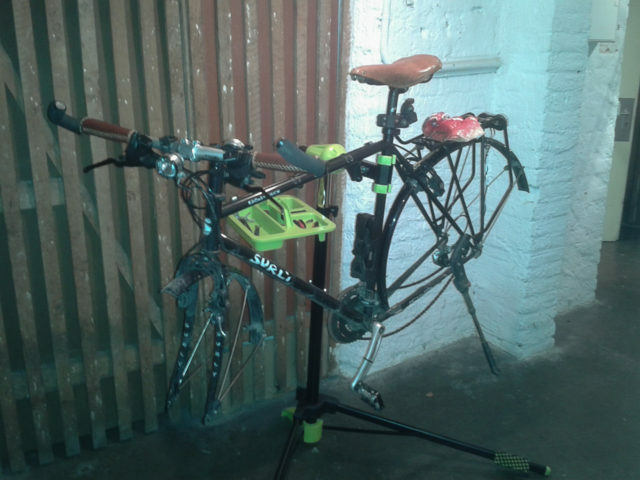 The assembly stand is a model by Kettler which can be adjusted in height and provides a rotatable clamp for the frame. The tool tray is also included. 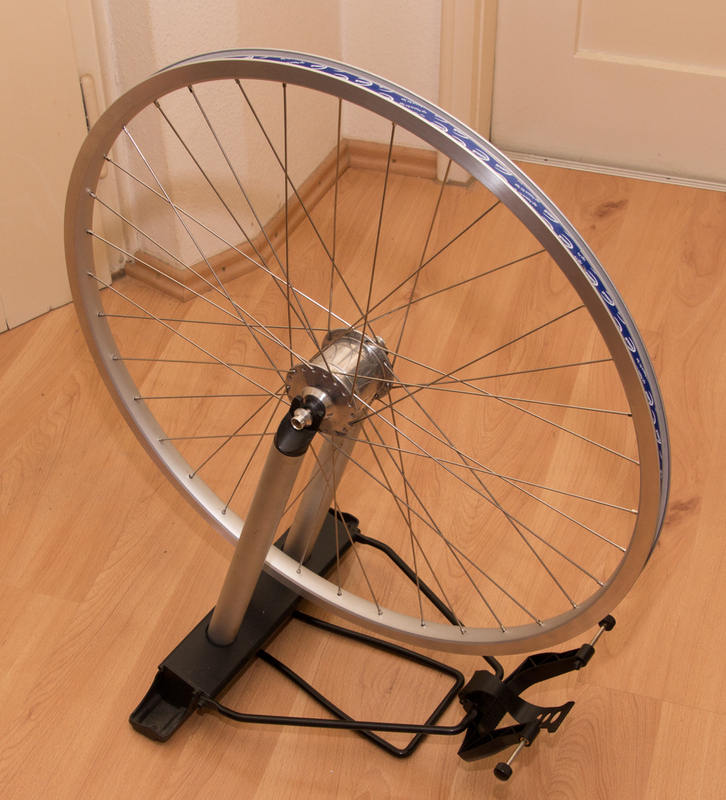 The front wheel was quite easy – the spokes are the same length on both sides and the complete rebuilding was finished in less than two hours. When lacing the rear wheel there was a little problem: Originally the hub was laced in a different way as it was required for the Andra 30. 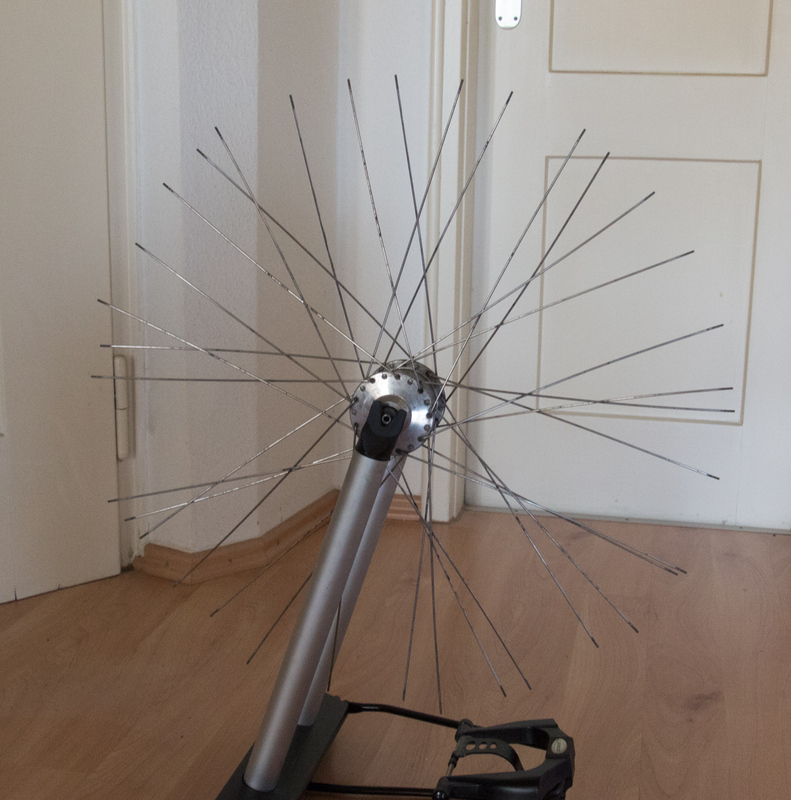 The rim needs a certain ordering of the pulling and the following spokes – and this can be done in two ways: Either first a pulling spoke on the left side and then a pulling spoke on the right side or vice versa. At the end I had to move the pulling spokes on one side of the hub by one hole so the spokes matched the direction of the slanted holes in the rim. I don’t recommend this! But I’m aware of the possible problems with the additional mechanical stress and accepted this. As explanation: Due to the high tension the spokes leave marks next to the holes in the hub flanges. 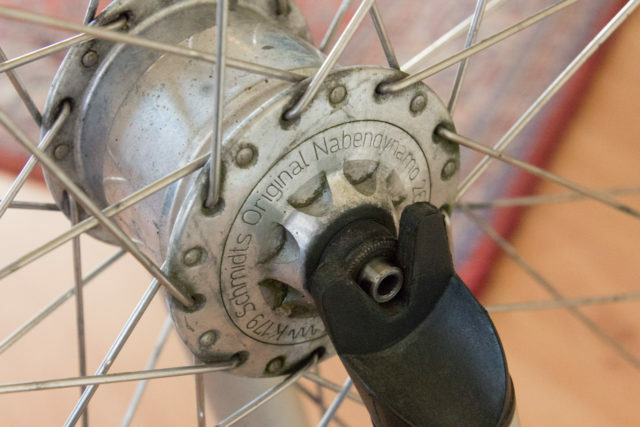 When you now lace the spokes in the opposite direction the spoke will pull from one side while the mark on the other side may act as groove which starts a crack. 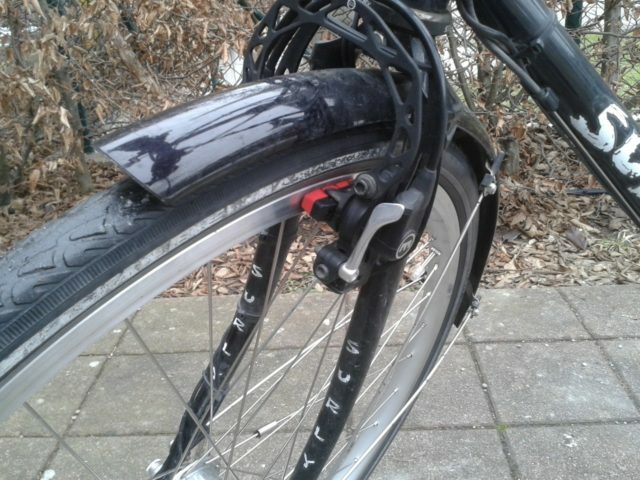 However the danger of an accident is quite low – in the worst case some spokes would break loose and the rear wheel would get heavily out of true, but a fall because if this is very unlikely. When researching this topic I also only found cases describing this for hubs with a large flange diameter, like Rohloff Speedhub, where the angle between the old and the new direction of the spoke as nearly exactly 90°. On my hub the spokes enter the flange at a much lower angle so the angle between the old and the new direction as much more then 90°. Therefore I expect the stress for the material much lower as well. Anyway mechanical engineers and experts for metalworking are welcome to correct me. On the brakes (Magura HS11) I had formely used brake pads by BBB, BBS-19HP to be precise. However this model is not listed any longer on the Website of BBB and is likely not be produced any more. Therefore I decided to return to the “original” design – then I don’t have to adjust the brakes again when I once have to replace the worn pads in the future. Very nice: On the new rims the brakes don’t squeal any longer as I experienced it in the past depending on temperature and humidity.